Relaxing together socially plays an important part in our community life and our calendar of social events includes all parts of the congregation. Much of our social life involves eating meals together, perhaps with other entertainment alongside the food. Regular events include our Congregational Harvest Supper at which members of the congregation are invited to ‘entertain’ us; our Pancake party which includes games and a rather competitive Pancake Race as well as eating. We often have a Burns Supper and, usually once a year, the Youth fellowship hosts a Murder Mystery Evening. We have also recently had a strawberry tea, a treasure hunt, a bonfire party and several barbeques in the church garden in the summer. 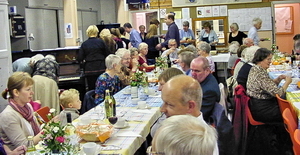 In addition to congregational events, the different groups and organisations within the congregation often organise social activities too. There are a number of social groups within the congregation. The Wives’ Group, largely made up of middle-aged to older ladies, meets fortnightly in the Hall on Monday Evenings at 7.30 pm for fellowship or to listen to an invited speaker. For more information contact Doreen Esnol (ku.oc.ilacsitnull@lonseneerod) or Pam Grimley (moc.loanull@yelmirGmaP). The Dorcas Group meets on Thursdays afternoons, starting with lunch and enjoys fellowship whilst sewing. For more information contact Sheila Hawkins (ten.liamsfnull@snikwah). The Women’s Guild is a small group of older ladies which meets from time to time. New members are always welcome. For information, contact one of the clergy in the first instance.